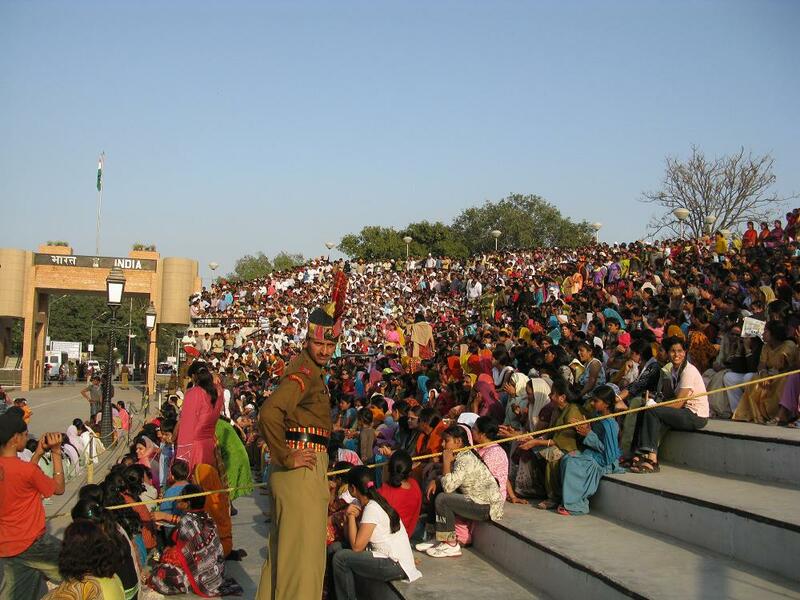 Banter at the Border – and a new Lingua India? In the last week, my travels have taken me to two of the great mosques in India (Agra and Fatehpur Sikri), to “play” in the Hindu festival Holi, to the Sikh Golden Temple, and finally to Dharamsala, home to the Tibetan Buddhist leader Dalai Lama and his government-in-exile. It’s enough to confuse even the most committed agnostic. 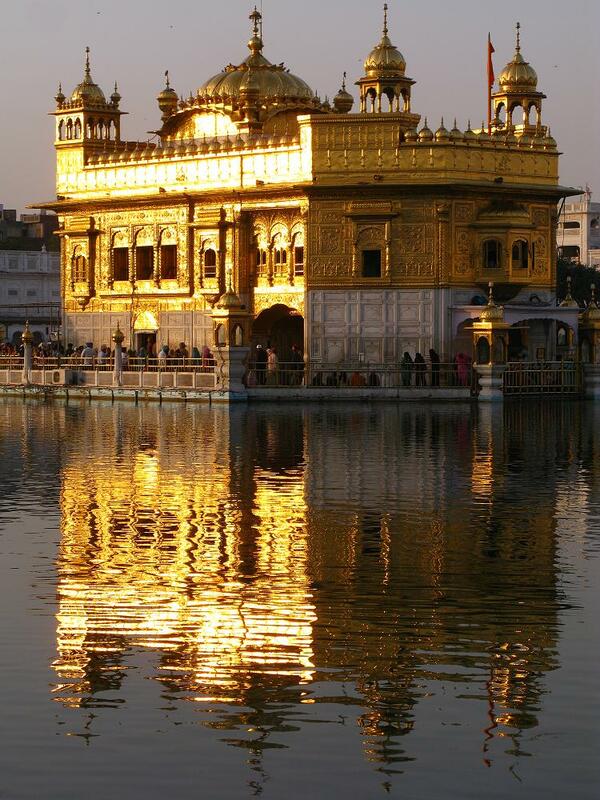 The Golden Temple was particularly stunning, meriting three separate visits, including one at 4am. The sight of thousands of circumambulating pilgrims combined with the sound of the recitation of the Sikh holy book the Adi Granth (read continuously 24/7/365) was unforgettable. Amidst this spiritual sensory overload, I took a trip over to the India-Pakistan border on Sunday, for a bizarre display that highlights the contrasting fortunes of these two countries. On this most arbitrary of borderlines (drawn on the map in 1947), the “lowering of the flags” at Wagah has become something of an attraction for patriotic Indians and intrigued foreigners alike. Driving out through the super-organised Punjabi fields (this area is the breadbasket for the country and has a prosperous feel to match) I noticed an advert painted on a building wall – “BHATIA GUN HOUSE Licensed for pistols and Gun Cartridges”. I wondered briefly if Wagah might have a touch of the Waco about it. In the event, it was all pretty good-natured. I arrived at the border at 5.30, walking the last kilometre with thousands of others for the prequel to the sunset ceremony. On the Indian side, in a large, incongruous stadium-style hemisphere of concrete seating, a few thousand colourful over-excited spectators were being whipped into a frenzy by a scary-looking ringleader in dark glasses. The screams – of “HIN-DU-STAN!” and “VAN-DE MA-TA-RAM!” (Hail to the Motherland) – were deafening. One of my neighbours was quick to assure me that everyone loves everyone really. The view on the Pakistan side might be a bit different. The contrast with the happy-go-lucky growing-at-5%-a-year Indians was stark. The Pakistani side looked dismal. A paltry couple of hundred sat in a similar sized amphitheatre. 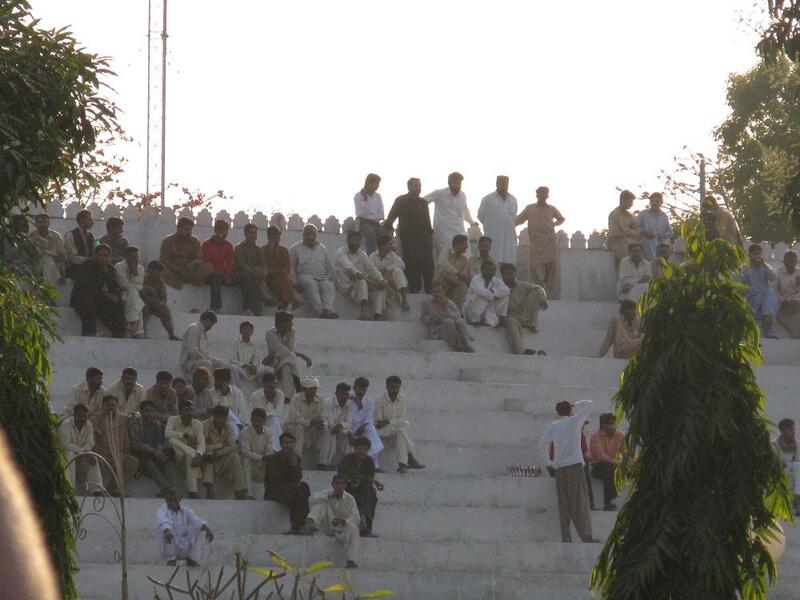 This lot looked dour, sad, dressed in bland greys and blacks, the women in burkhas against tatty white-washed seating. It was all a bit sad. The ceremony itself – choreographed in advance by both sides and involving copious chest-puffing and goose-stepping – was greeted with whoops, cheers, and more flag-waving and foot-stomping than a crucial Celtic-Rangers head-to-head. It was a vivid reminder of the continued blurring of the lines between politics, the military, warfare and sport – and of the strange relationship between two countries created out of the back-end of a failing imperial adventure in 1947. 2. The huge adverts for private schools everywhere always say “English medium” or “Hindi medium”. If the relative number of each is a reflection of market demand, India wants its children speaking English first and foremost. .
3. At the showing of Smile Pinki that I attended in Varanasi, everything (except the film) was conducted in… English. And that despite the fact that the audience was (with the exception of me and one other) entirely Indian. It’s all rather interesting. After a long period after partition where English was lingua non grata (while Hindi was being pushed forward), market forces may be shifting things. Most people here are also clear that English gives India something of a business advantage over its arch-rival China. The article goes on to talk of fighting “ripple-to-ripple, wave-to-wave”, of “follow-up Tsunamis”, of “getting past other brooks, creeks, and even seas”. There’s nothing like taking an analogy too far. Read the whole, wonderful, article here. Despite the attractions of feeling cold rain on my face for the first time in 4 months (Mcleod Ganj a.k.a Dharamsala is at 2827m), I am moving southwards from Dharamsala tonight so that I can get East before my visa runs out. I arrived in Varanasi (a.k.a. Benares, Kashi etc) on Wednesday morning, from Delhi. There are many stories to tell from 2 days of random meetings in Delhi, but since then I have had two intriguing and contrasting days in the City of Light. We were travelling on a cycle rickshaw in the University area when I saw the sign out of the corner of my eye. It was 4.15pm. Despite not knowing anything about “Smile Pinki” (other than that it was the other Indian Oscar winner – a documentary), the temptation to follow our noses was too great. We pulled over and joined the crowds heading for the University’s Medical Department Auditorium. At the front of the stage, 1 Indian woman and 6 Indian men, one of them with a small Golden Oscar statuette in front of him, sat behind tables. The 300 seats were taken. We found space and perched in an aisle. In no time, there were about 400 in the hall, crammed into every spare space. We were still unaware of what we had stumbled upon. But as we listened to numerous laborious speeches, it dawned on us that we were witnessing the homecoming of the two main stars of the documentary, a surgeon Dr Subodh Kumar Singh and an anesthetist Dr AN Singh, fresh from their remarkable success at the Academy Awards. 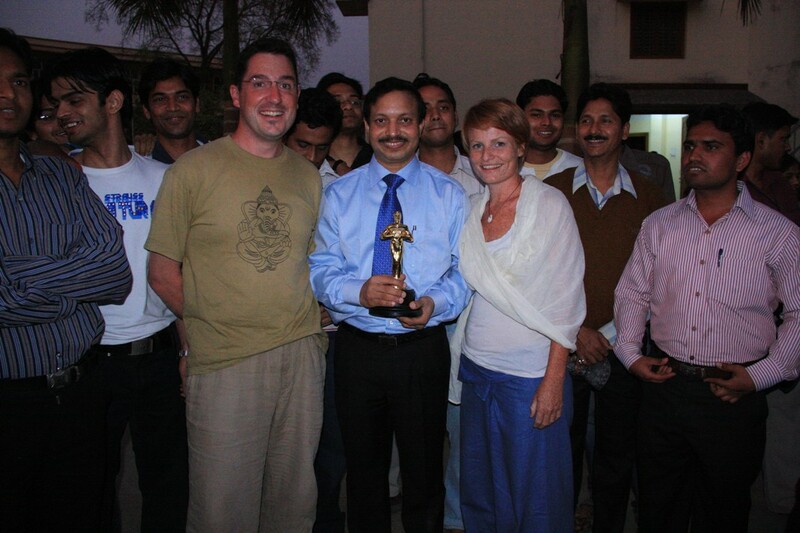 The documentary deals with the Cleft Palate problem (more prevalent in India than most over countries in the world) and a remarkable project to deal with this at Benares University Hospital. In rural areas of India, children born with Cleft Palate are seen as a curse on the mother, who will blame something like an Eclipse during pregnancy for the deformity. The children often end up ostracized by their communities, and even by their families. The documentary follows the amazing work of the Smile Train Team at Benares University, as they go out into the surrounding rural areas to convince people that their children are not “monsters” and perform the operation on many children in one of their regular sessions. One of the real insights from the documentary was the practical reason behind the ostracising – prospects of marriages for Cleft Palate children hovered belween slim and nil. Dr Subodh Kumar Singh was the last to take to the stage. He looked admiringly at the statuette in his hands. “I feel privileged to be among the few in the world to grasp the Golden Lady!” he said with obvious emotion. “As a doctor, I never thought I would get a chance to walk on the Red Carpet!”No-one could begrudge him his pride. He gave thanks to every member of the teaching staff, auditorium staff, auditorium cleaning staff, family members, ancestors etc. It was a speech worthy of the famously emotional, if lengthy, Oscar monologues. After an hour of speeches, the crowd were getting restless. When the compere suggested refreshments before the film started, a full-blown revolt seemed possible. The compere wisely took to the stage. “OK, we have heard you. The film starts now!” The 39-minute film (from a mere 100 hours of filming) did not disappoint. After an impassioned rendition of the Indian National Anthem, the famous Varanasi Ghats came into view. There were proud gasps from the crowd. It is a remarkable documentary with no narrated voice-over and no major production work. If you get a chance to see it, do so. Despite the fact that we were clearly gatecrashers, we managed to wangle our way into the post-film refreshments, and meet the stars themselves. It was all, once again, most bizarre – but then I am starting to realize that is the norm in this country, and certainly for this trip. The contrast with the previous day was stark. I had arrived off a night train, and after a restorative Puri Masala, we headed down to the Ghats, which are the 88 separate series of wide steps leading down to the sacred river Ganges. Hindus believe that if you die in Varanasi, you achieve instant Moksha (enlightenment). Most are cremated, with their ashes scattered on the river. Pregnant women and children are dumped directly into the river. We sat by one of the Ghats where bodies are cremated by the side of the river in stacked piles of wood. An interminable stream of bodies were brought to the river wrapped in cloth, dipped in the Ganges, placed on the pyres, and set alight, while others were rowed out to the centre of the river for the final passage. The whole place is suffused with a strange combination of gentleness, spirituality, and matter-of-fact practicality in the face of death. When you believe that we are all spiritual beings merely on a human journey, death becomes a mere passage. There is no need for weeping or wailing – these are solemn, but not unhappy, occasions. Look around and you notice the dogs defecating nearby, the children urinating in the street, the cows munching on the unidentified flotsam and jetsam at the edge of the river, the half burnt legs and arms being raked back into the pyres, even 21st century intrusions as mobile phones are answered at the side of cremations. It is also challenging to see people bathing in the same river where dead bodies and half-burnt body-parts are floating – the Hindus believe that bathing in the Ganges remits your sins. Strangely, none of this takes away from the essential spirituality of the place. As a major Hindu religious site, the temples in Varanasi are patrolled by endless bored-looking policemen in the run up to the General Election. Uttar Pradesh will be a fascinating battle-state, and attracts colourful politicians like Mayawati and Mulayam Yadav, both promising endless money for investment in Varanasi and making impassioned denunciations of the other in a rivalry that stretches back more than 20 years. But with a spiritual tradition that stretches back longer than any city in the world by some accounts, you get the feeling that the people of Varanasi can’t be bought. Somehow, Varanasi’s Oscar award, for a project imbued with such generosity of spirit, says so much more about this city and its potential future. We head towards Agra tomorrow. Given the forthcoming elections in India, politics are front of mind here. A couple of days ago, I had a brief insight into the student version, via a circuitous route. I had decided to try and get in contact with an Indian family that had looked after friends, Patrick and Mary Harrison, when they were here 15 years ago. Patrick (now retired) was Secretary of the RIBA and had been visiting an architect in Cochin. The architect had asked his secretary (Katherine Alencherry) to give them a tour of the Cochin backwaters. The ensuing brief trip (with father Sebastien who worked for Indian Railways, plus two children) was one that I was told all had always remembered fondly. Christmas cards had been exchanged since, but no further contact than that. To make the connection, I had been given a sparse architect’s scrawl – “ALENCHERRY, Railway Quarters 132/G (or 4? ), Beat No.9, Ernaculam South, Cochin”. This drew blanks from the owner of my hotel, as well as from his friends rapidly assembled to help. More enquiries in town were met with similar puzzled looks. I feared a wild goose chase. A couple of vague directions from random friendly looking people on the streets of Cochin didn’t feel particularly helpful at the time, but after a couple of hours I found myself on the first floor of a small building in a tight back street by the Ernakulam Railway Junction. I knocked on the non-descript door more in hope than expectation. (I recalled a discussion with my father before leaving where we had agreed that “the best thing about being a pessimist is that you’re never disappointed with the outcome”). I didn’t have time to be disappointed. Instead I was taken aback by the welcome I got from Sebastien and Katherine Alencherry. It was pure chance that Sebastien had a days leave, and that Katherine had returned home for lunch. They had no warning that a random man would be turning up at their door saying he knew someone that they last spoke to 15 years ago. Tea was conjured up; rapid telephone calls were made; in no time 3 turned into 6 as their law-student son Karol turned up with two of his college friends; plans were made without any consultation of me; and within minutes I found myself in a cramped Suzuki Maruti 800 heading for Cherai Beach with Karol and his friends. Slightly stunned, I told them that while I was delighted with the rapid turn of events, I was concerned that I might be keeping them from their studies? After a lengthy walk and plentiful conversation, I returned to Cochin for dinner, and an unexpected dip (fully-clothed) in the pool of the pricey Malabar House Hotel. (It’s a long story, not quite as loutish as it sounds, and not making it onto the blog). I am now in the tea plantations of the Kanan Devan hills. Another amazing bus-ride to get here, and now traveling for a few days with the afore-mentioned Justin, who rode here on his Royal Enfield Bullet. We are staying with legendary Joseph Iype, made famous by Dervla Murphy’s book “On a shoestring to Coorg”. Given the out-of-town location of Joseph’s home, moving anywhere involves riding pillion down potholed roads on Justin’s Royal Enfield Bullet motorbike. Which is just as fun as it sounds. Just a quick note to say I’m quite a distance away from Mumbai and heading South. I am obviously following developments after the tragic events yesterday. Cafe Leopold, one of the targets, is a cafe well known on the traveler circuit which I went to every day. Given I was in an aeroplane from South America to London on Sept 11th 2001, and was in a tube on the way to Kings Cross on July 7th 2005, this is about as far away as I’ve been from a terror attack. Pretty sure it will be connected to the elections that are going on over the next couple of months. I was going to post on the power cuts here, but that can wait.